Welcome to Round 1 of YCS Salt Lake City! We’re kicking things off with a Feature Match, showcasing Utah Duelist Jonathan Westover’s Ancient Gear Deck! He’s using a lot of the Ancient Gear cards released recently, which allow him to make some very strong plays with giant machines. He’s up against Stephen Klaus, an Arizona Duelist using Pendulum Magicians. We’ve seen Klaus at many a YCS before, including a Top 8 finish at YCS San Mateo in 2013. Klaus started with Dragon Shrine, sending Supreme King Dragon Darkwurm to the Graveyard. He Special Summoned it and added Supreme King Gate Zero to his hand. He Normal Summoned Timegazer Magician, and Link Summoned Heavymetalfoes Electrumite. He used it to put Astrograph Sorcerer in his Extra Deck. He played Gate Zero, and destroyed it with Electrumite to add Astrograph Sorcerer to his hand. He Special Summoned the Sorcerer and added another Gate Zero to his hand, then drew a card with Electrumite. He played Pendulum Call, discarding Black Fang Magician to add Purple Poison Magician and Harmonizing Magician to his hand. He activated Instant Fusion for Lyrilusc – Independent Nightingale. He used its effect to deal 500 damage, then used it with Electrumite to play Zefra Metaltron. He played Black Fang and Gate Zero in his Pendulum Zone, and Pendulum Summoned Timegazer, Gate Zero, and Darkwurm from his Extra Deck, along with Purple Poison from his hand. 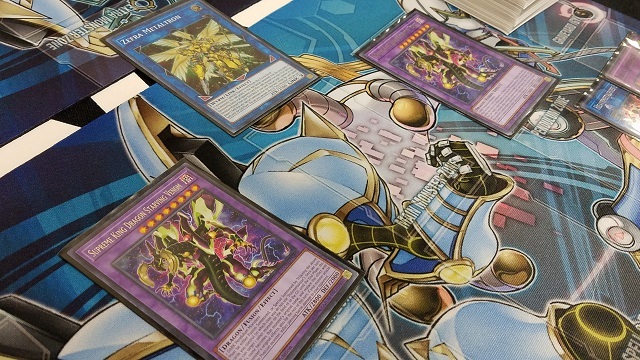 He used his DARK monsters to play two copies of Supreme King Dragon Starving Venom! They each took on the effect of Independent Nightingale, dealing a total of 8000 damage on the first turn! 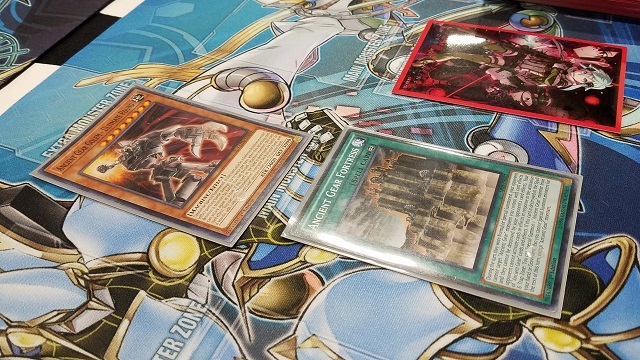 Westover played first this time, with a hand of Ancient Gear Golem – Ultimate Pound, Twin Twisters, Ancient Gear Box, Ancient Gear Wyvern, and Ancient Gear Hunting Hound. He Set Twin Twisters, then Normal Summoned Wyvern – Klaus negated its effect with Ash Blossom & Joyous Spring. Klaus Normal Summoned Darkwurm, adding Gate Zero to his hand, then activated Pot of Desires. He played Gate Zero in his Pendulum Zone, then used Duelist Alliance to add Pendulum Call to his hand. He played Call, discarding a spare Duelist Alliance to add Black Fang and Harmonizing Magician to his hand. He Pendulum Summoned Harmonizing Magician, which also brought Purple Poison to the field. Westover flipped Twin Twisters, discarding Box to destroy Gate Zero. Klaus used Harmonizing and Purple Poison to Link Summon Heavymetalfoes Electrumite, which put Astrograph Sorcerer in his Extra Deck. He had Electrumite destroy Darkwurm to get Astrograph Sorcerer in his hand, then Special Summoned it and added another Darkwurm to his hand. He drew a card with Electrumite. He used Allure of Darkness, banishing Darkwurm. Black Fang halved the ATK of Ancient Gear Wyvern, then he destroyed it with Astrograph. He attacked directly with Electrumite. Westover drew Ancient Gear Fortress and activated it. He played Hunting Hound, dishing out 600 points of damage, then used its effect to fuse Hunting Hound with Ultimate Pound, for Ancient Gear Howitzer in Defense Position. It dealt another 1000 points of damage. Klaus used Foolish Burial to send an Astrograph Sorcerer to the Graveyard. He played Darkwurm in his Pendulum Zone, and had Electrumite destroy it to put Gate Zero in his hand. Then, he drew a card with Electrumite’s other effect. He played Gate Zero in his Pendulum Zone, and Pendulum Summoned two Darkwurms from his Extra Deck, as well as Timegazer Magician from his hand. He used Timegazer and a Darkwurm for another Electrumite! He had it destroy Black Fang to add Astrograph Sorcerer to his hand, and he Special Summoned it. He used his first Electrumite with Darkwurm to play Zefra Metaltron, then used his two Astrograph Sorcerers to play Odd-Eyes Absolute Dragon. He then used Absolute Dragon with his other Electrumite to play Underclock Taker. 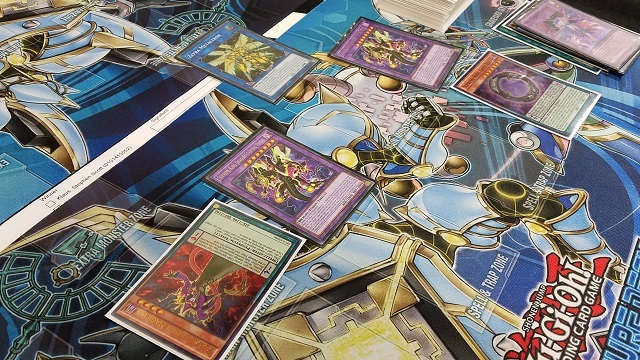 Absolute Dragon’s effect brought Odd-Eyes Vortex Dragon to the field. He took some time to read over Ancient Gear Fortress again, and passed his turn. He didn’t want to trigger Howitzer until he could handle it. Westover drew Hunting Hound. He Normal Summoned it and dealt 600 points of damage. He had Howitzer deal another 1000 points of damage. Klaus Pendulum Summoned Darkwurm from his Extra Deck. He switched Vortex Dragon to Defense Position. He used Underclock to reduce Hunting Hound to 0 ATK, and wiped it out with Metaltron. Westover was down to 2050 Life Points, while Klaus had 4800. Westover drew Power Bond and Set it. Klaus decided to finally go for it. He sent Zefra Metaltron to destroy Howitzer, and Westover used it to Special Summon Ultimate Pound. Klaus saw that there was only a few minutes left in the round, and he had no way to get over Ultimate Pound. He opted to concede this Duel, so he could get into his Side Deck and start the third Duel quickly. Klaus played Chronograph Sorcerer in his Pendulum Zone, using its effect to Special Summon Timegazer Magician. He played Darkwurm in his Pendulum Zone, which played Supreme King Gate Infinity in his other Pendulum Zone. He Normal Summoned Black Fang, and Link Summoned Heavymetalfoes Electrumite. It put Gate Zero in his Extra Deck, then destroyed Darkwurm to get Gate Zero to his hand and draw a card. He played Gate Zero, then used Gate Infinity’s effect to add Instant Fusion to his hand. He used it to Fusion Summon Independent Nightingale, dealing 500 points of damage. He then used it and Electrumite to play Zefra Metaltron. He activated Pendulum Call, discarding Pot of Desires to add Purple Poison and Black Fang to his hand. He played both in his Pendulum Zones, and Pendulum Summoned Gate Zero, Gate Infinity, and Black Fang from his Extra Deck, along with Harmonizing Magician from his hand. Harmonizing Magician Special Summoned another Black Fang. He used Gate Zero and Black Fang to play Supreme King Dragon Starving Venom, copying Independent Nightingale to deal 4000 points of damage. He then used Gate Infinity and Black Fang to Summon another Starving Venom, dealing 4000 more points of damage and taking the Match! Stephen Klaus is the victor with Pendulum Magicians! Round 2 Feature Match: Corbin Diez vs. Alessio Giordani YCS Salt Lake City: Round 3 Pairings!